List Rules Vote up the fan theories that seem the most plausible. With nine seasons to work with, fans of the NBC smash sitcom The Office have come up with plenty of conspiracy theories. If you watched the series, you might know the characters well enough to be emotionally involved in their lives, so a fan theory about one of your favorites might hit you right in the feels. Here are some fan theories about The Office that may shock, anger, and maybe even emotionally destroy you. Creed Bratton (played by Creed Bratton) is undoubtedly one of the more mysterious characters on The Office. With a whole slew of cryptic quotes and strange mishaps to choose from, it's surprisingly difficult to answer the question: "Who the heck is Creed Bratton?" For starters, he may not Creed Bratton at all. 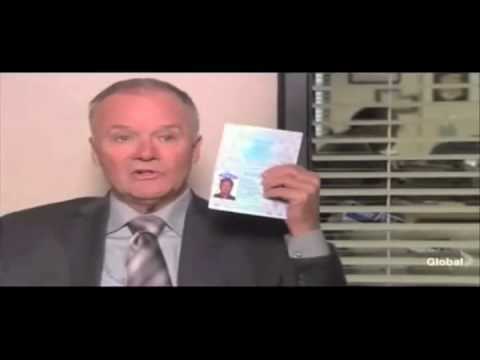 If you remember the "Money" episode from Season 4, Creed flashes his real passport for the world to see, and it clearly says "William Charles Schneider." Creed Bratton is not Creed Bratton. In one episode, he states that he transfers all of his debt to an account under the name William Charles Schneider. In another, he states that the last guy who stole from him was never seen again and his name was Creed Bratton. I propose that Creed's real name is William C. Schneider, and after a man named Creed Bratton stole from him, he killed him and took his name. In the Season 2 finale “Casino Night," we see Jim (John Krasinski) kiss Pam (Jenna Fischer), then they just stare at each other. But things look very different in the Season 3 premiere "Gay Witch Hunt." That scene opens mid-kiss before Jim smiles and says, "You have no idea how long I wanted to do that." According to this fan theory, there's footage missing between two separate kisses. Jim kisses Pam and then, after a pause, Pam kisses back. Season 3 shows the alleged second kiss. Pam seems to support this theory later in the season when she reveals to Roy (David Denman) that she kissed Jim. There are plenty of reasons why Michael (Steve Carell) could possibly despise Toby (Paul Lieberstein). As the human resources representative at the Scranton branch, Toby is the only person with any real control over him. Michael is also eternally optimistic to the point of delusion while Toby is depressed. But Michael's hatred could have much deeper roots. Toby represents Michael's worst nightmare: a lonely, divorced father who rarely gets to see his kid. More than anything in the world, Michael wants to have a family and be happy. We see this potentially play out in a Season 7 episode in which Michael has to sit through six hours of mandatory counseling from Toby. Michael is openly hostile until Toby tricks him into opening up while playing board games. What does Michael talk about? His daddy issues. If we look at all the stuff Michael gets away with, it's clear that Toby isn't ever coming down on him as hard as he could. As the corporate HR rep, Toby could have gotten Michael fired literally dozens of times. My theory is that Michael's parents divorced when he was young, and he now channels his anger and feelings of abandonment towards Toby, who is a divorced father. Michael has no sense of subtlety or nuance, and so [he] doesn't see that Toby is a far better father and human being than his own dad. While the identity of the notorious Scranton Strangler is eventually revealed, one fan theory suggests Toby is the real killer. Remember when Toby suddenly decided to move to Costa Rica? The murders began right after he returned. But things eventually get even more suspicious in later seasons. Toby ends up on the jury that convicts George Howard Skub, the accused Scranton Strangler. But Toby later develops doubts about Skub's guilt and goes on a crusade to prove his innocence. There’s a detailed breakdown of this theory here. It’s a long read, but it makes a very convincing case.